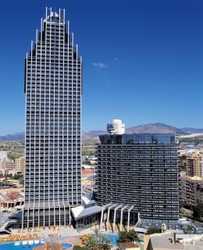 The Gran Hotel Bali in Benidorm boasts 776 bedrooms which are large and comfortable. Each room either has a balcony or terrace. The Gran Hotel Bali is situated in the area of La Cala, Benidorm, close to the sea with the most incredible views of the bay and only a short distance from "Terra Mitica". It's the most original hotel on the Costa Blanca, distributed into two buildings one of which stands 186 metres high, the highest hotel in Spain. This was are first holiday as a married couple and was going to be a late honeymoon. The whole thing started to go wrong when we opened the room door. The lights never came on, the room was the size of our mop cupboard with no sea view no balcony just a view of a kids play area on the roof and a taxi rank. The whole place was catered for Spanish people and us English would just get pushed out of the way. The food looks nice and sometimes does taste nice but its never consistent. The staff along with most of the Spanish tourists are both ignorant and rude. To sum up this place it looks amazing on the web site and in the brochures but in reality I have more welcoming stay at the travel lodge on the M6. DON'T GO. Huge reception busy and noisy akin, to being in London train station. Nice size rooms and view. Food always cold, despite numerous complaints and reports. T Shirt taken from my room after being handed in by my next door neighbours. Cleaner said she would hand in but didn't. Several trips to Manager produced no luck. I have since read reviews of other thefts. Staff indifferent towards English, though I spoke Spanish to them. I mixed personally with the Spanish mainly during my monthly stay here. One bar is frequented by the Spanish and has dance lessons; the top I "lost" was only worn for 1 hr for one of the lessons and was special dance top. Buses are easy to get from outside hotel into town but either very long walk back or taxi if after 10.30pm. Glass lifts offer great views. Pool bit crowded, very cold and mainly in the shade. Worth considering as a base if you see a cheap deal but not as special as described. Apart from being a very impressive hotel from a distance unfortunately this all goes down hill when you walk in to the large and rather unwelcoming reception area. The majority of the staff are rude and unhelpful and would prefer to be dealing with Spanish or German guests. In fact the whole hotel is geared towards the Spanish clientele. The food is repetitive and bland and the bar area (inside) looks like an airport waiting lounge. All of this changed on our last evening when it changed to their winter schedule which looked so much better with nice entertainment and little lounge bars scattered around the hotel. The rooms are accessed by a key card however when my camera was stolen from my room on the 23rd floor and their computer showed that the maids key had been used 3 x that morning to get into the room, nothing was done. "This Was The Best Holiday Of Our Lives"
This was the best holiday of our lives. The hotel is out of this world with very friendly staff. The rooms are excellent and the food is just as excellent. We went on a girlie holiday and the only disadvantage is that we just wish it had been closer to the new town in Benidorm. It wasn't too much problem though as there are regular buses into town at a set price of 90 c. Getting a taxi was about 6 euros which again wasn't too bad. we would recommend this hotel to everyone at any age. We look forward to our next holiday at the Gran Bali and after only being back 2 days we are checking the prices for our next visit. I wouldn't rate this hotel at all, big disappointment staff are rude had the same food every night. We had to go out for dinner, sick of looking at fish and the people in the restaurant were so rude. When got there we didn't have a balcony or sea view what we asked for, we had to take our own bed sheets off so they would get washed. Came back to our room on a couple of occasions to get changed for dinner and had no towels, would have to wait until they brought them to us that could have been about 7 o'clock one night. Had the same entertainment every night same singers same songs it was terrible and very much catered for Spanish. This hotel ruined my holiday, would not go back. Looks nice from outside but the inside is a disappointment. Seriously need to look over their staff. Don't waste your money.